Los Angeles (July 13, 2017) – Helinet Aviation, one of the most respected helicopter operators on the West Coast, announced today in partnership with Brown and Firehawk Helicopters, the addition of a Sikorsky UH-60A ESSS (External Stores Support System) Black Hawk to its fleet. The ship, which Helinet will market as MovieHawk™, is the first UH-60 based in Los Angeles that is specially equipped for the motion picture and television industry. The aircraft is available for use across the country and further augments Helinet’s position as a leading provider of aerial film production services. Emulating the look and presence of a special operations MH-60M helicopter, the twin-engine MovieHawk™ operated by Helinet is currently the only ESSS model of its kind available within the industry. The aircraft is specially outfitted with exclusive features including the capability to carry authentic inert rockets and gun pods, external fuel tanks, and is additionally equipped with a rarity in the civilian world, a feature known as FRIES (Fast-Rope Insertion and Extraction System). MovieHawk™ also features an in-demand and specialized military paint scheme to allow production companies to create the most realistic and mission correct scenarios. “MovieHawk™ provides a perfect complement to our existing production operations and will allow us to continue to provide the world’s most innovative, turnkey and safe helicopter production services,” said Helinet CEO Kathryn Purwin. MovieHawk™ will be flown by former Sikorsky Experimental Test Pilot and SAG member, Alex Anduze. NVG certified and highly experienced with real world military operations, including fast roping and tactical insertions, Alex has worked on a multitude of productions and has worked closely with Helinet’s VP of Aerial Film Production Kevin LaRosa II. 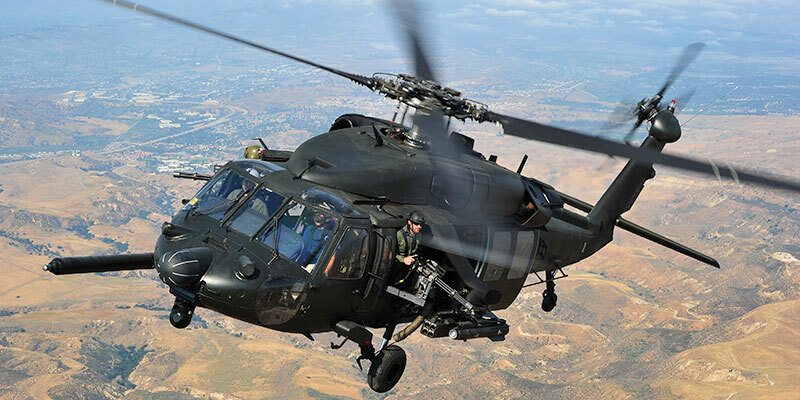 Two of the most sought after features of a special operations Black Hawk include an aerial refueling probe and ESSS side mounted wings for external stores; both of which are available as options. Additional features include an MH-60M nose radar section and optional inert weapons like the Wescam Matrix weapon system, 19 tube rocket pods, AGM-114 Hellfire missile, and window and pod M-134 Dillon mini guns. With a global network of helicopter partners and one of the largest fleet of single and twin-engine turbine helicopters on the West Coast, Helinet has been serving the film production community for over three decades. From script breakdown, FAA approval, up through the accumulation and utilization of correct assets, Helinet is recognized as the go-to provider of turnkey aerial production services.